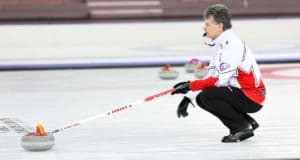 Einarson, vice-skip Val Sweeting, second Shannon Birchard, lead Briane Meilleur and coach Patti Wuthrich had struggled with consistency through the first 15 ends of two games Wednesday at Affinity Place, losing their morning game and trailing Flaxey. Suddenly Einarson found her draw weight and the game turned. They scored two in the fifth end and stole two in the fifth. “That was huge, that was the game turner,” Einarson said of the steal. Einarson started well with a deuce in the first end but gave that back in the second. Flaxey stole one in the third when Einarson’s final stone draw was swept hard to get past a guard but then slid inches long. In the fourth Einarson came up short with her last rock draw to the four foot, giving Flaxey a steal of two and a 5-2 lead. Then the Einarson crew dug in its heels, bouncing back with a deuce of its own in the fifth, a steal of two in the sixth and a steal of one in the seventh for a 7-5 edge. In the other women’s games in Draw 3, Casey Scheidegger (2-0) of Lethbridge, Alta., stole two in the ninth and one in the 10th to rally past Rachel Homan (1-1) of Ottawa 7-5, and Jennifer Jones (2-0) of Winnipeg scored three in the ninth end to beat Darcy Robertson (1-1) of Winnipeg 9-7. 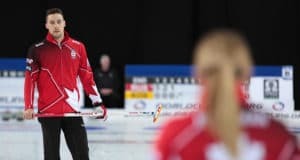 On the men’s side, Kevin Koe (1-1) of Calgary beat Matt Dunstone (0-2) of Regina 9-6 while Brendan Bottcher (1-1) of Edmonton defeated Reid Carruthers (0-2) of Winnipeg 9-5. 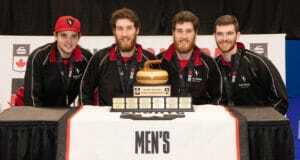 The 2018 Home Hardware Canada Cup continues with draws Thurday at 9 a.m., 2 p.m. and 7 p.m. (all times CST).